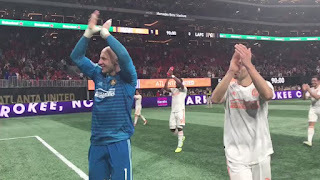 The MLS regular season clash between two of the last three MLS expansion teams ended in favor of the old boys, as Atlanta United FC dominated LAFC 5-0 on Saturday at Mercedes-Benz Stadium. The action started early, as Atlanta defender Chris McCann was issued a straight red card in the first minute for a foul on Benny Feilhaber. But following Video Review, referee Ted Unkel reversed the call and reduced the sanction to a yellow, welcoming McCann back on the field. Atlanta then took the lead in the 17th minute, as Miguel Almiron sent a low cross through the box and found Julian Gressel wide open at the back post. 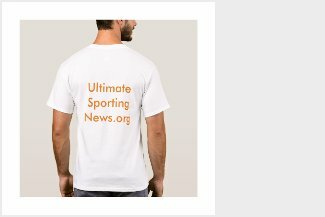 Atlanta went 50 minutes before their next tally, as Gressel's cross was met by Josef Martinez's head directly in front of goal to pad the hosts' lead. 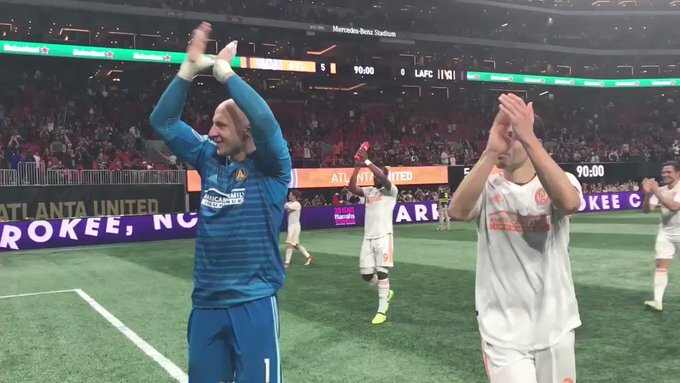 Things unraveled for the visitors in the final 10 minutes, as they conceded two penalties, both converted by Almiron, to make no mistake for Atlanta United. LAFC rookie Joao Moutinho was given a red card for the second penalty, for picking up two yellow cards. But that wasn't all, as Atlanta substitute Romario Williams grabbed yet another goal near the end of stoppage time to finish in style.